Okay a little bit of full disclosure before I begin this review – I haven’t actually read this entire hardcover collection. Not yet, anyway. For starters, it’s over 1,200(!) pages, containing basically every single minicomic released in association with the He-Man brand (not counting regional variants, etc). More importantly though, this is a collection that I believe should be savoured, not binged. That said, I’ve read enough to get a pretty solid flavour of what’s going on; the interviews, the background information, the strips associated with my favourite Masters (Trap Jaw and Tri Klops, in case you were wondering), and I can state without fear of contradiction that this is absolutely everything that He-Man fans could possibly hope for, plus a little bit more. Much like Dark Horse’s previous release, The Art of He-Man & The Masters of the Universe, the sheer unbridled affection shown by the makers towards this particular franchise is truly inspiring, and with a collection that goes all the way from Glut and Alcala’s “He-Man and the Power Sword” back in 1982 to Neitlich, Seeley and Alves’ “The Powers of Grayskull” released with the recent MotU Classics line, there’s bound to be something here for everyone. Personally, I happened to be born in exactly the right time for He-Man, growing up with the figures, cartoons and – yes – the minicomics during my formative years. However, being relatively young at the time, I was far more interested in the figures themselves than the comics that came with them, so this collection is an ideal way for me to travel back to my childhood and take the time to fully appreciate the fantastic work that was being done by Mattel’s marketing department, and by the creators involved in the production of these comics. So, how to review a collection of 1,200 pages of comics? Well, let’s start with the quality. The strips themselves are beautifully recreated; crystal clear scans, but still possessing the charm of the originals. The smaller page size gives a more authentic reading experience, even if this hefty tome can be a little unwieldy at times. Everything is laid out clearly and concisely, broken down into relevant sections with interviews and clear breaks between each minicomic. The interviews themselves are fantastic for the most part and truly insightful, featuring such luminaries as Gary Cohn, Mark Texeira, Stan Sakai, Lee Nordling, Val Staples and Tim Seeley. I would have loved to be able to hear from Bruce Timm about his time working on the franchise, but I guess that just wasn’t to be. We also get a little backstory about some of the different ‘phases’ of the He-Man action figure universe, from the original series to the Dolph Lundgren movie tie-ins to the She-Ra: Princess of Power range, making this a truly comprehensive time capsule of the history of the franchise. Overall, as a complete history of He-Man and the Masters of the Universe minicomics, this is exactly the exhaustive, lovingly recreated collection that fans have been crying out for. You can look at it as an encyclopaedia, a glorious time capsule to the golden age of toy marketing. After all, with around seventy million toys sold worldwide in the first two years, these were some of the biggest print runs in the history of comics. You could also look at it as a wonderful retrospective of the tireless work of some truly talented creators. But, if you’re like me, you’re going to look at it as a tangible slice of your childhood, the countless hours of unbridled joy spent playing on your bedroom floor captured in a hardcover volume and placed in your thirty-something hands. 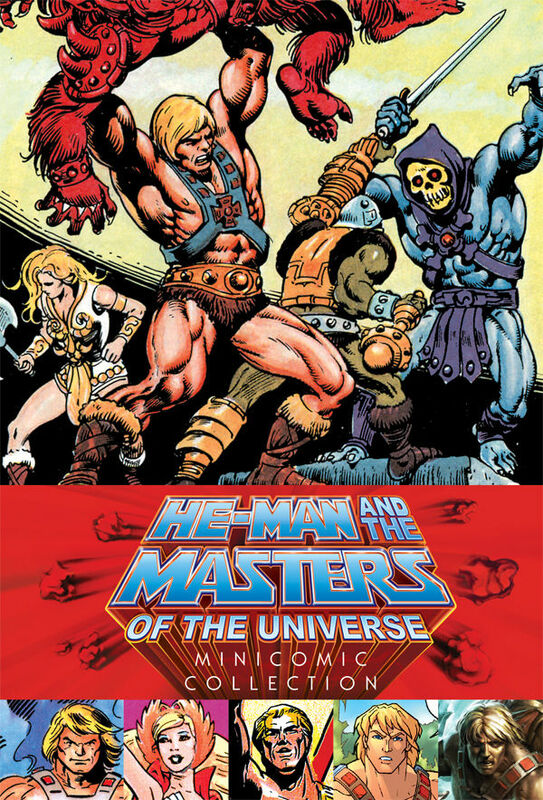 Simply put, this volume – along with The Art of He-Man & The Masters of the Universe – is absolutely essential reading for any and all He-Man fans out there. Get them both, and thank me later. My Dad’s works were sort of mini paintings for the original 4 issues. He also did the 45rpm release, and some subsequent ‘mini-comics’.